Energy One: a fast grower in the Australian electricity market. This is an example of the kind of research I do when I’m investigating an idea. Right now I’m looking at foreign micro-cap stocks for ideas. Here is one I found. It seemed like a good value, but didn’t meet my level of risk tolerance due to its reliance on a few high-value contracts and some temporary work that is boosting results. I have gotten burned too many times on small companies receiving a few big contracts that later dry up, leaving a much less profitable business behind. Energy One provides software and services to wholesale electricity, gas, and carbon trading markets in Australia. The business model is based on selling one software system to a customer at a time, then upselling to further systems as the relationship develops. To further these plans, the company plans to make acquisitions of complementary businesses, so it can continue to bundle software packages into its product suite. This results in operating leverage, because the same staff can be used for maintenance of the old package and installation of the new package, resulting in higher profit margins. In the early part of 2014, Energy One secured two major contracts with Australian energy utilities, Alinta Energy, and one other unnamed entity. Alinta has already purchased the entire Wholesale Energy Trading Suite. The other utility purchased the Energy One Trading platform in July of 2014. So these revenues were not recognized until the half ended December 31,2014. Finally, a third utility company has expressed interest in upgrading its systems from a previous version of Energy One’s software to a newer one in the near future. Currently, it is trialing this new version, so there are no guarantees, but a new contract would probably allow for continued profitability for at least another year or so. The company receives revenues that are recurring (Licenses, support and maintenance, IT services, ongoing enhancements and engagements), and one-off (labour services for project-based implementations). These project based implementations generally last for 12-24 months from commencement. Thus, the major projects announced H2 2014 and H1 2015 (calendar year 2014) will reach the closing implementation stages during H1 2016 (calendar year 2015). Furthermore, as EOL has grown, it has been able to leverage its employees. 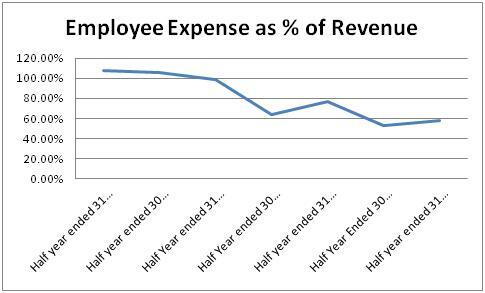 It’s employee expense as a % of revenues is down to 58%, from greater than 100% 4 years ago. Other, more fixed expenses are coming down as a percentage of revenues too, showing the power of EOL’s business model to leverage fixed expenses. 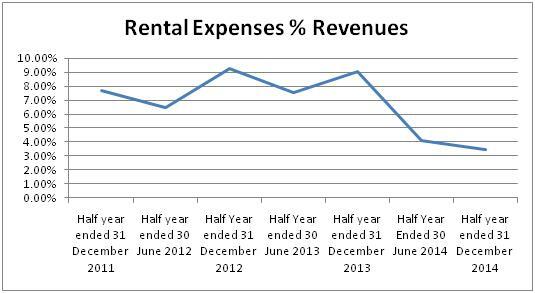 I regard Rental Expense, Accounting Fees, and Insurance Expense as more fixed expenses. These fixed expenses are smaller than employee expenses to begin with however, so leveraging these fixed costs will have a smaller impact on the bottom line. The one expense that is not decreasing as a percentage of revenues is the consulting expense. The uptick in consulting expenses this last half is related to its recent major contracts. The company increased the numbers of both regular employees and consultants to deal with the new work. The outside consultants are mostly helping in software installation at the two major Energy utilities that signed on in 2014. Per the CEO, “As the projects revert to long-term support, these project costs will reduce as a proportion of revenue”. 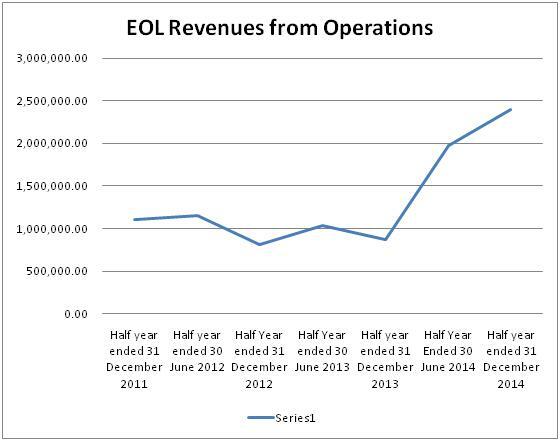 As of the last half-year, ended December 31, 2015, EOL received about 16% of its revenue from a R+D tax incentive. This down from 21% for the year ended June 30, 2014, signaling decreased reliance on government support for profitability. Still, its tax incentive in H1 2016 was about $380,000, almost equal to its overall profits before income tax of about $390,000. So if these R+D tax incentives are wiped out, then EOL’s profitability could evaporate overnight. According to the Australian Taxation Office, a refundable tax credit is issued to eligible entities with revenues less than $20 million AUD, whereas a non-refundable credit is issued to all other eligible entities. So, if EOL has made a mistake in assessing its eligibility for the tax incentive, the ATO could ask for a lot of money to be refunded. Did you incur the amount (or pay the amount if your expenditure is to an associate)? Is this amount eligible to be claimed under the R&D tax incentive? Is the amount incurred on R&D activities that are registered with AusIndustry (who act on behalf of Innovation Australia)? Have you apportioned your expenditure so that you are only claiming amounts to the extent they are incurred on R&D activities? Do you receive the major benefit from the R&D activities on which you incurred expenditure? Have you kept, or can you access, sufficient records to support your claims? To the best of my knowledge, Energy One’s activities do seem to account for the kind of innovation that would qualify for the credits. However, I have no insight into whether the amounts claimed by Energy One are all eligible or not. I will assume the company has properly assessed the amount of the credit, but I will keep an eye on this as a risk to look out for. Every year, EOL receives the incentives related to the previous year’s R+D activities. For the year ended June 30 2014, it received $720,247, which was the total amount spent on R+D in 2013. This is substantially higher than the $549,432 recognized on the income statement – one of the major reasons that cash flow was higher than net income for FY2014. The reason for the discrepancy between the income statement and cash flow recognition of the credit relates to portions of the companies R&D that relate to employee expenses and those that relate to capital expenditures. Whereas in the U.S., R+D expenses are included on the income statement, in Australia, these tend to be recognized on the cash flow statement, if the R+D expense is not an employee salary cost. For EOL, $549,432 of its employee costs were related to R+D, so this amount of the credit is recognized on the income statement. However, the total R+D credit is recognized on the cash flow statement, because all R+D costs are included on the cash flow statement. For fiscal 2015, EOL has already received $709,326, which was exactly equal to what the company stated it would receive in the annual statement from June 30, 2014. Energy One has had an easy time with taxes so far because of a large build up of accrued tax losses. However, this stash of tax assets is about to run out. The amount left as of December 31, 2014 was only $92,790, down from $611,877 on June 30,2014. This means that pretty soon, likely in the next half, EOL will be forced to start paying taxes. And this will certainly decrease profitability and cash flow. This means we will have to use theoretical after-tax numbers to value Energy One. If Energy One had had to pay taxes in the last half, it would have generated a net income of $273,964 for the six months ended December 31, 2014. This figure is much less tantalizing than the $513,060 it reported, which was boosted by an income tax benefit of $121,683. For the half ended June 30,2014, it reported a net income before tax of $540,478, which would be $378,334 after Australia’s 30% business tax. Together, this yields a TTM net income after tax of $652,298. Compared to an enterprise value of $4.274 million, that looks pretty good, giving it an EV/net income of 6.5. In the Chairman’s Report, Energy One Chairman Ottmar Weiss mentions that many of Energy One’s customers are operating in “depressed wholesale market conditions”, particularly in the electricity sector. This is worrisome, since the other customer segments, like energy, are not faring particularly well either. I don’t see much reason for weakness in the domestic electricity market other than the general economic weakness in the Australian economy. This generally depressed state relates to the poor environment for commodities globally. In the meantime, Energy One seems able to grow even in depressed conditions, leaving it in a prime position to benefit if there is an uptick in the general economy. Ideally, customers would recognize that improved IT systems may lead to decreased costs in the long run, but in a cash crunch, companies usually don’t splurge on big capital expenditures, even if they may be cost-saving measures. So this is definitely a risk to EOL’s business model. One of the long term trends that the managing director mentions as a potential headwind is the growth of domestic solar power. This decreases the need for consumers to tap into the energy grid. However, in my opinion, this risk is far from materializing. Due to the general downturn in oil and gas prices, electricity in Australia is only getting cheaper, reducing the impetus to switch to solar. 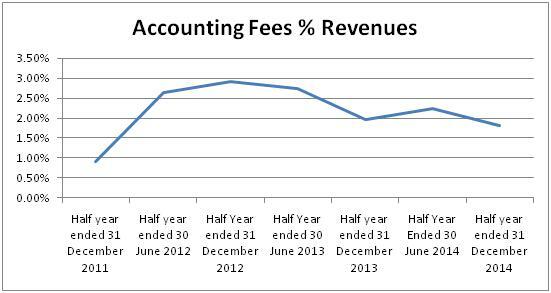 How much of revenues are made up of license fees and on-going product support? During the installation period, the company receives installation fees, but after this period (i.e. beginning H2 2016) license fees and product support may become the main source of revenues. At what margins will the company be able to operate on a license fees and product support model? Will they be able to pull comparable profit margins to what they have been making in the past half, when installations were underway? This statement bothers me for two reasons. 1) the CEO referred to the revenue base as comprised of one-off project incomes. Rather than use the wording, “partially comprised”, he simply used “comprised”, which makes me think the breakdown between project implementation revenues and recurring revenues is heavily skewed to the former. This is bad news, because unless the company can sell new systems, it will likely sink back into the red again, under the weight of all the new employees that were hired for implementing these new system installations. Even if the consultants are let go, permanent employee expenses more than doubled over the course of H2 2014 and H1 2015, so if revenues go down to the levels of FY 2013, the company would quickly turn from a net profit to the biggest net loss in its operating history. I don’t think this scenario is likely, due to the new recurring revenues and the fact that another major utility expressed interest in upgrading, but I think the risk of this scenario is too great to warrant an investment at this time. I am going to have to pass on Energy One until I see a new contract signed, or we get more information about how large the recurring revenue figure will be.